Hoists and cranes are constructed with many small and unique parts. In many cases, parts are custom built for individual machines. Pieces of devices cannot be exchanged freely. If they are, there is a substantial likelihood of the hoist not working or for the crane to fail during operations. CM Hoist sells replacements parts for their devices. We proudly house and sell a vast array of pieces and components for the full-line of CM hoists. Not only do we carry parts, we also provide controls, pendants, chains, and lifting accessories. We sell manual, electric, and air hoist parts. We are your one-stop shop for hoist replacement parts and accessories. Specific information can be found on the CM Hoist website. Our talented team can also help you determine the parts you need for your machine. Rather than being confused about your purchase, call us, and we will help you get the right hoist parts. 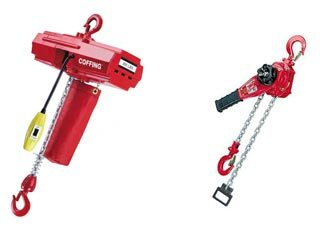 We carry a full line of Crosby hoist parts and Coffing hoist parts.